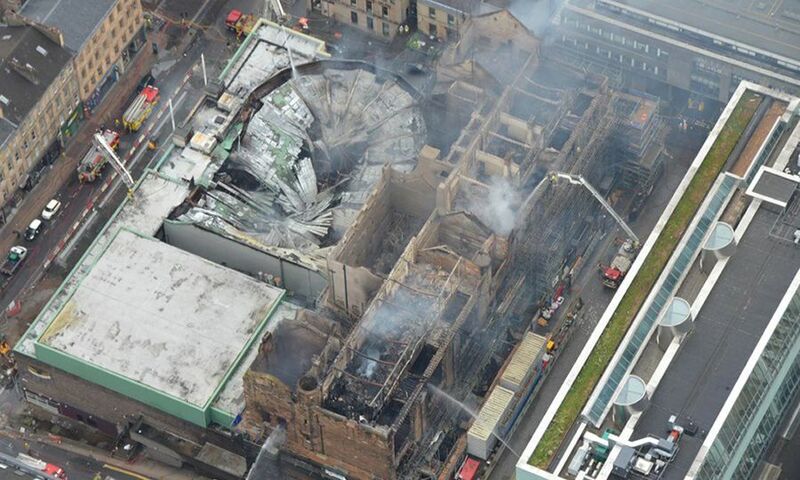 Devastating news from my birth city of Glasgow today, her gorgeous gem, her world famous, Mackintosh-designed School of Art has suffered a terrible blaze, even worse happening while it was still undergoing restoration from a previous, smaller fire that damaged this artistic and cultural and historic prize. This fire is far worse, some architects are already thinking it may be beyond repair. This is a dreadful event; this isn’t just the destruction of a cultural and historic site, Mackintosh’s famous design is live history, it is woven into the pulsing, live heartbeat of the vibrant artistic, creative soul Glasgow nurtures across decades, across social and class and ethnic divides. It’s heartbreaking to see the devout restoration work go up in flames after the last disaster, it seems unbelievable it could happen a second time, let alone while many struggled to repair and restore the damage of the last fire. My beloved Caledonia has, for centuries, punched above her weight: a small kingdom of mountains surrounded by the cold northern seas we have generated philosophers, artists, writers, scientists, doctors and engineers far beyond the sum of our small population, our Scottish Enlightenment has been a beacon of civilisation, and the Glasgow School of Art has been a part of that, fostering, nurturing talent from all walks of life in that egalitarian way Glasgow does (growing up in Glasgow one lesson I learned was that it considered that art and culture was for all its citizens, not just the prosperous chattering classes, our museums and galleries served all, encouraged all). Glasgow School of Art, designed by one of the world-famous Scottish artists and architects, Charles Rennie Mackintosh, has produced a seemingly endless stream of cultural and artistic greats across the century and half, from Doctor Who’s Peter Capaldi to poet and dramatist Liz Lochhead, the great John Byrne, Scottish comics god Frank Quietely, and Norman McLaren. Glasgow’s famously egalitarian approach to both science and the arts has helped foster and produce world-class creative talent, nurtured in an environment designed by a fellow artist and architect. This is heartbreaking, it feels like someone has pierced the heart of my vibrant, beating heart city that suffered so much from the decline of its great industries and rebirthed itself partly through these same arts and cultures. This is beyond damage to our shared culture and historic and artistic heritage, it’s a blow to the heart of a vibrant, living artistic culture that, from a small land on the far northern edge of the world has nurtured and encouraged creative genius in so many walks of life: world-wide reputation artists, Nobel winning writers, engineers, scientists and more. It’s a horrible wound to our nation’s remarkable cultural heritage. Glasgow has suffered worse. Scotland has suffered worse. New creators will arise from the burnt ashes like a magnificent Phoenix and spread their fiery wings across our skies to light a way to the future while illuminating the shadows of the past. This is heartbreaking, devastating news, this blaze, this destruction. But Glasgow School of art is about creation, not destruction. Like its home city which survived the loss of its mighty industries which made it, which remade itself afterwards, it will too remake itself and it will be a beacon once more to artists we don’t even know yet but will one day nod proudly at when they are named in great international awards and say, aye, they trained at Glasgow School of Art. I’m horrified at the lost of so much of of our gorgeous, built, designed, crafted heritage. But that’s not the real heart of Glasgow, nor her School of Art, it’s heart is the urge, the need to create, express ourselves. That cannot be restrained by fire and demolition. Wood burns, even stone fails eventually, fire claims and burns, but the desire, the urge, the need to create is never quenched. Writers will write, painters will paint, sculptors will sculpt, film-makers will craft their imagery. Fire does not, will not stop us. It is not just stone and wood and carvings and buildings. As long as we dream, and think and feel and create, the School of Art exists. Creativity exists. Glasgow breathes and her heart beats and continues.